Once again, I've come up with another idea on how to change the "Where are they now?" posts on Choicest Games and this time it's kind of a compromise of what I had originally done before. In my original "Where are they now?" posts, I would often examine one particular computer game developer or composer and give you guys an in-depth look at how they got into the gaming industry, where they've been and, of course, where they are now. Ultimately, the only important part of information (and what the title of these posts suggest) is where all these great developers and composers have ended up, and whether they're working on any choice PC games still. So I'm going to focus on that now, but instead of just looking at one person, I plan to look at teams of people or at least key personnel that worked on a particular game. My guinea pig for this new style of "Where are they now?" 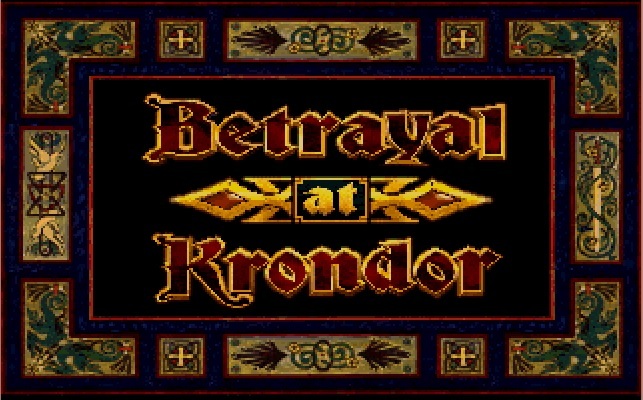 post is going to be the key personnel behind the development of a classic Dynamix RPG called Betrayal at Krondor. This game was released in 1993 and is set in the fantasy world of Midkemia, developed by author Raymond E. Feist, famous for the Riftwar series of books. Despite the game being licensed from Raymond E. Feist, he only oversaw plot development at a high level and Neal Hallford and John Cutter were the ones primarily responsible for the game's story. Feist eventually wrote a novelisation of the game that is considered canon with some of the events in the game even being mentioned in the Riftwar novels. In terms of what these three are up to nowadays (i.e. Raymond E. Feist, Neal Hallford and John Cutter), Feist is still writing fantasy books. He concluded the Riftwar Cycle in 2013 with the release of the book "Magician's End" and is currently working on a new saga called "The War of the Five Crowns" with the first book, "King of Ashes", to be released next year. In terms of those working for Dynamix, Neal Hallford and John Cutter, Hallford now works for a company he created in 2001 called Swords & Circuitry Studios which is apparently a "multimedia development company" that specialises in the development of "entertainment properties for gaming, television, film, the web, and other traditional publishing outlets". He states that he works regularly as a game designer, film producer, media consultant and fiction writer. Earlier this month, a short horror film that Hallford worked on called "The Case of Evil" was released for online viewing. Cutter, who served as the designer of Betrayal at Krondor is still working on games but nowadays it seems like he's focused on Facebook games at a French development studio called Pretty Simple Games. He joined the studio in September as a Senior Game Designer. Oh, and whatever happened to the composer of the music, Jan Paul Moorhead? Well he's apparently a Professor of Contemporary Writing and Production at the Berklee College of Music nowadays. Not sure if he's still composing music for games any more though. As for the rest of the team: Mike McHugh, the art director, was still in Eugene, Oregon where we created BAK, and still doing art (though not in the computer gaming industry as far as I know), though I've not had contact with him for many years. Nels Bruckner, the lead programmer, is still working in the industry as far as I know, as well as programmer Steve Cordon. Another programmer, Timothy Strelchun, is now working for Intel. I believe that Mark Verrier, who was an artist for the team, still works in the industry as does Vance Naegle. Thank you very much for responding Neal and many thanks to you and the rest of the team for developing Betrayal at Krondor - truly a classic RPG of the 90s :)!